I am new to this....so sorry for any errors. A small startup company in Cameroon named Forest House is trying to start a seed selling business. More information can be found on the following image for Forest House. Currently all enquiries or orders can come directly to me on foresthousecam@gmail.com due to knowledge of various countries import requirements, packaging and various payment options including Paypal. They are friends of mine, they are honest and reliable. They have the following seeds in stock. If anybody is interested then please email me on foresthousecam@gmail.com, minimum order is $50 plus postage whether EMS Express or Airmail. Prices are based on small quantities, however discounts do apply for larger orders. I have purchased various Monodora seeds from them before in the past and everything has been above board and honest, and I have had no problems. They are aware of the USDA & other countries requirements regarding permits, no soil, no insects and no pulp. The seeds I received were fresh and I had an 80% germination rate. Please also note Duguetia staudeti is also available when in season, more pics to follow as I receive them. Cola sp (extremelly hard to locate) price is TBA based on numbers....please email for quote and availability. Can't say it doesn't sound interesting - there is a lot of very rare and sought after species on the list - but please introduce yourself a bit better than the 4 posts above.! Do you know any of the other members on this forum (or possibly the yahoo forum), or have you mailed seeds to any member before - and does the Cameroonian company have a website or likewise? Thank you for your reply and interest. I really do not know what else I could have said to introduce myself I think its pretty straight forward enough, but sorry. The company is a cooperative with other African countries including Tanzania, Uganda, Gabon, Kenya & Zimbabwe and works with poor farming communities to introduce analogue farming and sustainability, includes workshops, training and to encourage ways for villages and farmers to be self sufficient and generate income. No, I do not know anybody from this forum and no I do not know anybody from a Yahoo forum. Seeds have been sent to numerous people in the past, but nobody from this forum. Unfortunately much habitate loss has been occuring and thus many species are becoming extremelly vulnerable. Thus trees of these species have been propergated and depending on the season seeds will become available to help increase income for those who need it most. It also gives the wider international community the opportunity to grow some of these species, on the off chance they are no longer around in 10-20 years time. Are you interested in any species inparticular Soren? Wouldn't you have a few of these species yourself as the range is quite large on some of these species. Particularly the Monodoras & Xylopias. I will check on a website for you, but as you know most companies in Africa do not have the funds for websites, and or internet access. Amendments have been made please see above information re the company. The page about Forest House is unreadable. Can you please repost it with larger size? Also i don't see any link between Forest House and CENDEP on their website? Sorry this is my 3 time to get the size right...see if you can read it now? Forest House is a startup company thats a subsidiary of CENDEP, most likely nothing has been added or amended on CENDEPs site. However just to make sure everything is legit and people feel comfortable please send a quick email to CENDEPs contact email from their website and please post to say all is correct oncce you have a response. I know CENDEP very well from their work on Gnetum africanum and was corresponding with Mr. Eric Fondzenyuy last year; is he still the "Knowledge Management Officer"? Yes, this is correct....however just remember CENDEP isn't doing the seed sourcing venture, its subsidiary Forest House is. 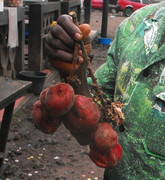 I am going to be doing a trial order of these seeds from Cameroon and will report back as soon as i get the package. Good luck with them, Oscar. I've been corresponding a lot with Troy lately and he seems an alright and above board chap. But will post again as soon as i get their first package. I'm hoping all goes well as this could turn out to be an excellent resource and a real water shed in accesing those hard to get african seeds. I am very interested in the six Annonaceae species listed. Im interested in some seed 2. Fool me once shame on u, fool me twice shame on me...especially if you fooled me for more than $100usd. but a little trust can go a looooooong way. Well Adam it's a lot cheaper and safer than traveling all the way to Africa! This guy is obviously not a run of the mill heister, as he knows his plants. Only thing that makes me nervous is that he is an intermediary, not the one actually sending the product. But it's also not your typical situation: Cameroon. Keep your fingers crossed that all goes well. It would be awesome to have some of these species spread around. Duguetia staudtii Currently a field trip underway. There is a further couple of species which are endemic to Cameroon they include Duguetia barteri & Duguetia confine. There are also a few species of Uvariopsis & Uvariastrum, as well as Isolona. Anything new that comes in will be notified. Just a quick comment on the trust situation, I have had about 3 to 4 parcel sent EMS from Cameroon and all arrived perfectly, and the seed were all fresh and germinated perfectly. I agree there are some countries in Africa that I would avoid purchasing from but Cameroon, inparticularly Forest House, Tanzania and a few others are perfectly ok.
Oscar has put some trust in, and 100% it will pay off. DHL or EMS Express is available from Cameroon. Anybody who purchases and has a dodgey experience then please post your out comes on here, besides the minimum is $50, whats $50 or even $100 worth these days really. Thanks for the update; did the collectors give a description of the taste? Actually good question. Apparently the cauliflorous Diospyros hadn't been seen before by the collector, but I wll check for you and see if he tasted it. Oncoba sp, not much is known on this species, other than its cauliflorous. I know that some Oncoba species pulp is edible, not sure on this one, but will check for you also. Some Oncoba spp are, but many considered bland I believe. But very interesting looking fruits! the diospyros look like Diospyros kamerunensis (bong-afoum).